Nabha Das is a saint poet who wrote about other saints of Vallabha sect and Vaishnava saint poets. He composed poems on seers, saints and sages. The selected compositions of Nabha Das are available in this Bhaktamal (garland of devotees). It is believed the he lived during the 17th century AD. He belonged to the Ramananda Sampradaya – the sect following the teachings of Ramananda. There is a confusion regarding the birthplace of Nabha Das, first it was believed he belonged to a learned family from South India. Now, some scholars are of the opinion that he lived in Gwalior. Nabha Das was initiated into sannyasa by Mahanta Sri Agra Das, Jaipur’s Galata Gaddi, who himself belonged to the Ramananda Sampradaya. Since a holy garland in Hinduism contains 108 beads, Nabha Das also wrote 108 poems, each of six lines, on the lives of famous bhaktas of the Vallabha sect and other Vaishnava poets. Bhakta Mala, the most important work of Nabha Das, has many commentaries. The best among it is the one written by Priyadasji. 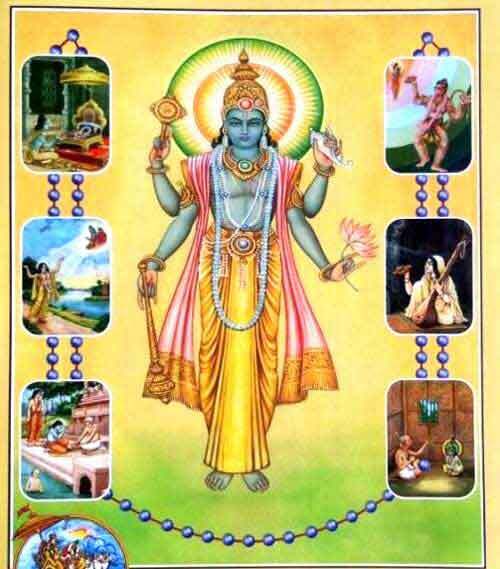 Bhakti Mala delves into the life of saints that graced the earth in all the four yugas. The book is reckoned as the most authentic account of the great saints of Santana Dharma.